In The Most Powerful P, Penelope, Pedro, and Pauline set off on a great adventure to discover the most powerful “P” word. Along the way, they encounter many powerful words that begin with “P,” but they all fall short in the quest to find the most powerful “P.” Before the day ends, the trio has a revelation. They realize the word “prayer” is the most powerful “P” because of the great power we have when we lift our prayers to God. 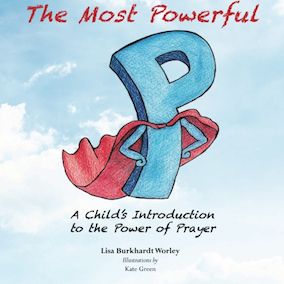 Written by Lisa Burkhardt Worley and illustrated by Kate Green, The Most Powerful P is a wonderful book to introduce young children to prayer. It’s fun, the artwork is engaging, and it’s great way to increase a child’s vocabulary.